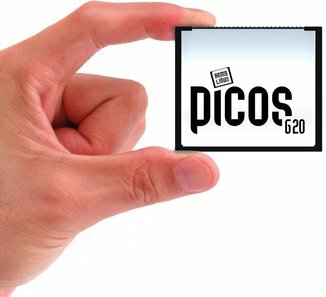 Super compact Linux: our picosG20 - CPU-Module. And on-top: with small color-TFT as innovation fair premier: picolino! NanosG20 is an industrial mini-PC. This stand-alone PC boasts energy-saving operation and a compact size. A wide variety of interfaces are available for communication. The Linux operating system is pre-installed on the NanosG20. The xmegaA1-Board is a universal GPIO board equipped with a powerful AVR microcontroller. Many common interfaces are supported and several peripherals can be connected via the extension bus. xmega.Dip is a Breakout Board for the Atmel AVR XMEGA A4U Microcontroller with simple access to all processor-pins. The SAMDIP-7X ARM7 board can be used to encrypt and decrypt data. Supported interfaces are: Ethernet, USB 2.0 device, USART, I/O ports and a CAN bus controller. A starter kit is available. The SAMDIP-7S ARM7 board is equipped with a power-saving ARM7TDMI processor core. Supported interfaces: USB 2.0 device, USART, I/O ports, TWI, ADC and SPI. Size: 50.8 x 17.6 mm. A starter kit is available.